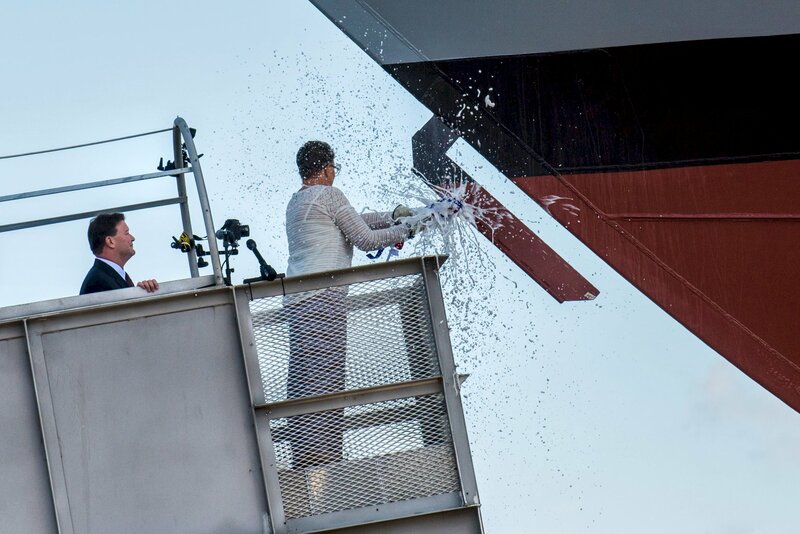 04 March 2013: Contract Awarded to Lockheed Martin Corp.
"Billings, The Ship" - "Billings, The People"
259k 02 September 2015: Billings, Mont. 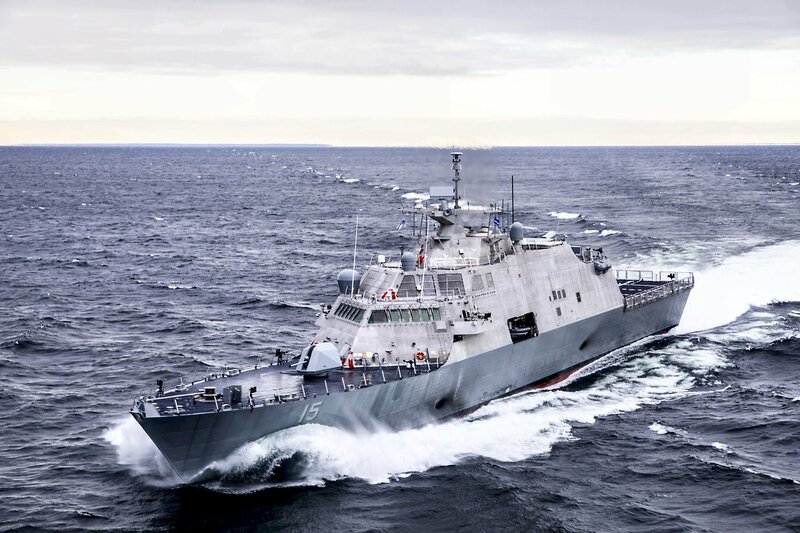 - Secretary of the Navy (SECNAV) Ray Mabus delivers remarks at a dual ship-naming ceremony for the Navy's newest Littoral Combat Ship, the future USS Billings (LCS 15) and future Virginia-class attack submarine, USS Montana (SSN 794), at Metra Park Rimrock Auto Arena. 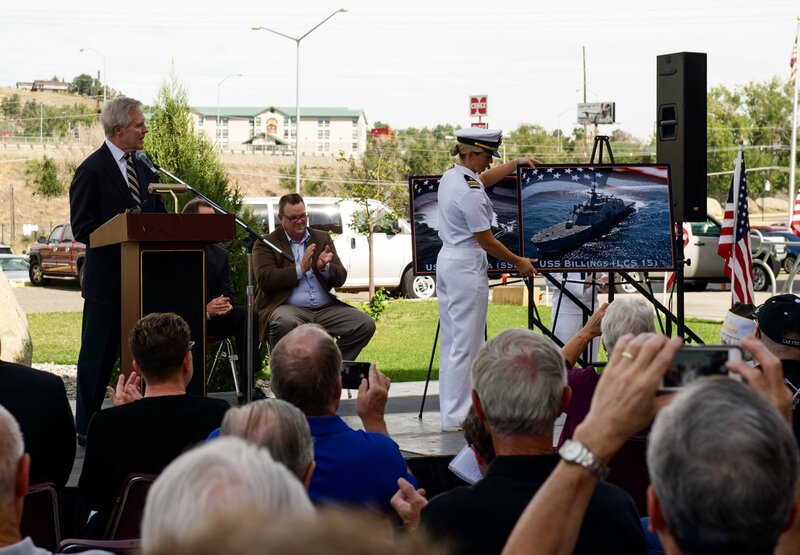 Mabus thanked the people of Montana for their support and contributions to the Navy and discussed the special bond that exists between a state and its namesake vessel. 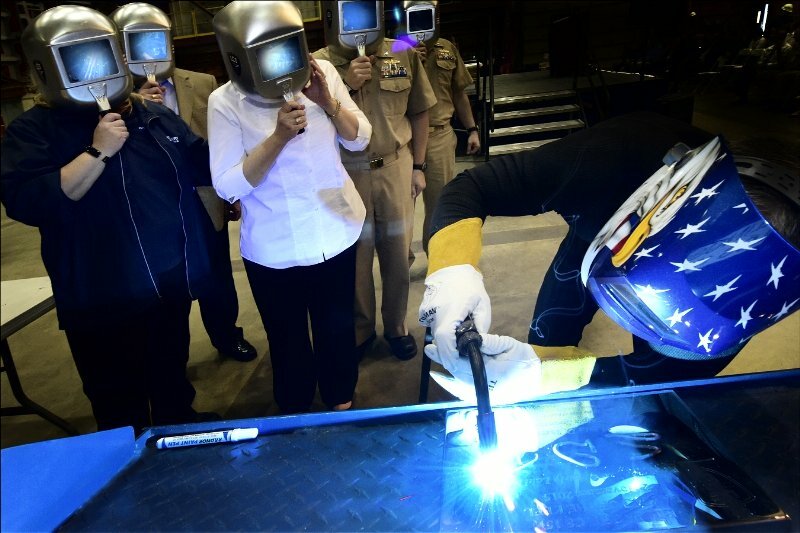 259k 03 November 2015: Marinette, Wis. - A welder authenticates the keel by welding the initials of the ship's sponsor, Mrs. Sharla D. Tester, onto the keel plate of the U.S. Navy's fifteenth Littoral Combat Ship (LCS), the future USS Billings (LCS 15), in a ceremony held at Fincantieri Marinette Marine in Marinette, Wisconsin. 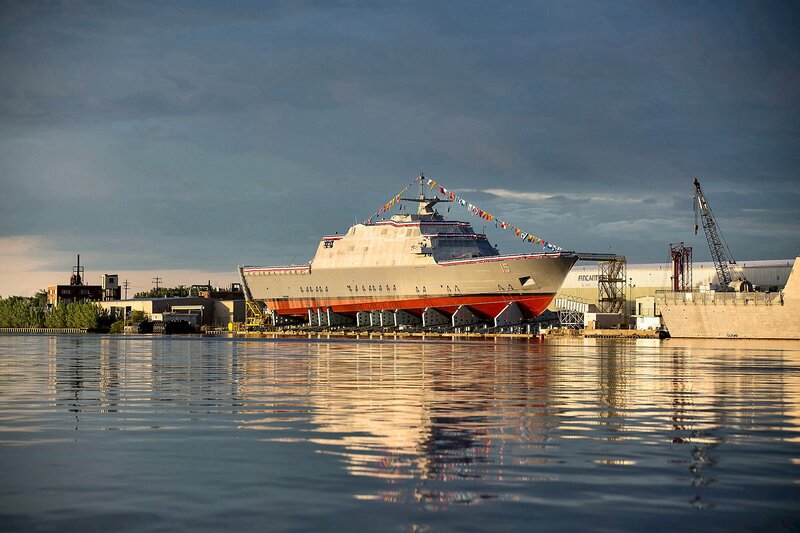 The Keel Laying is the formal recognition of the start of the ship and module construction process. 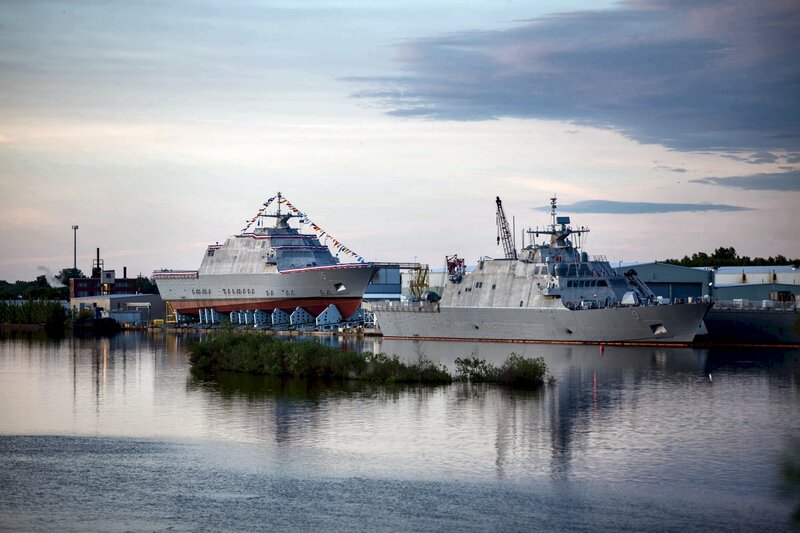 217k 16 June 2017: Marinette, Wis. - The 15th littoral combat ship, the future USS Billings (LCS 15) is pictured next to the Menominee River ahead of its christening on 01 July 2017. 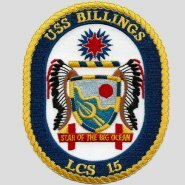 Once commissioned, LCS-15 will be the first ship named Billings in naval service. 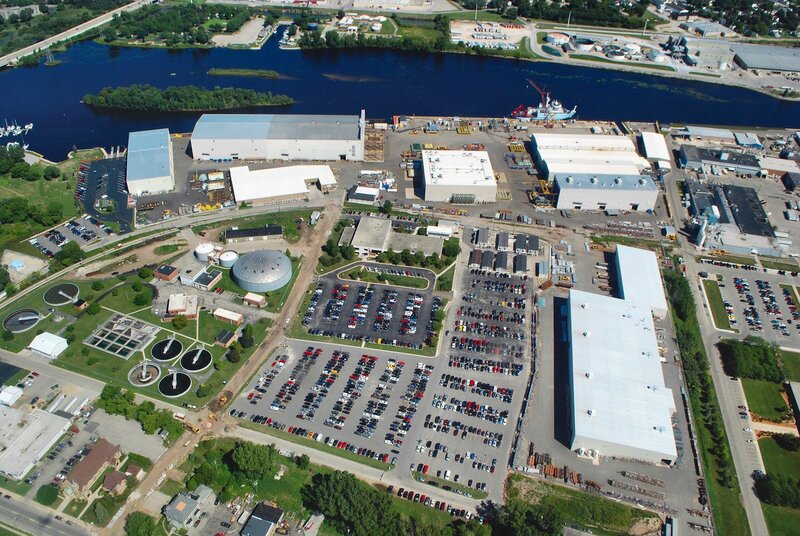 372k 01 July 2017: Marinette, Wis. � A beautiful morning sunrise over the Menominee River. 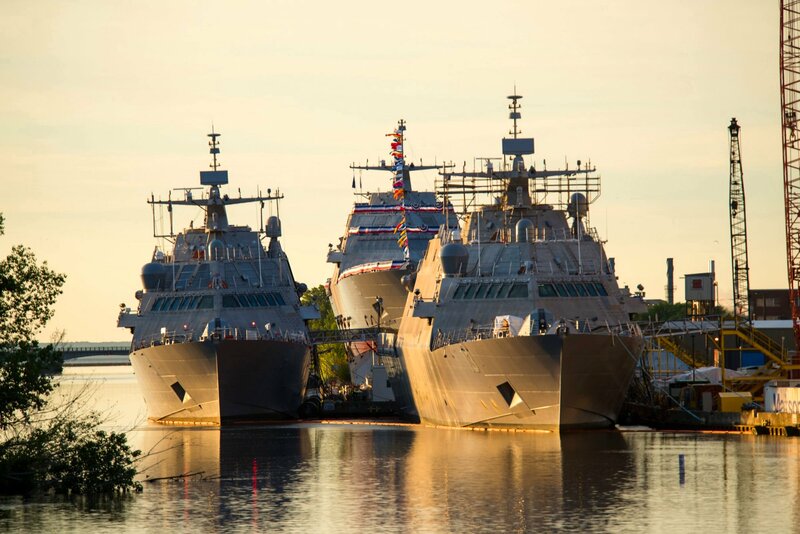 PCU Billings (LCS 15) sits high in her launch cradle while PCU Little Rock (LCS 9) and PCU Wichita (LCS 13) sit peacefully at their fitting out piers. 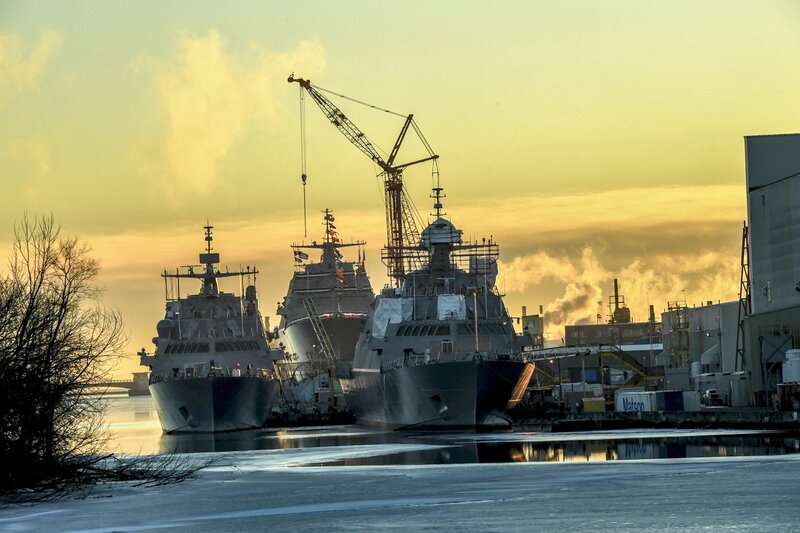 467k 01 July 2017: Marinette, Wis. - The future USS Billings (LCS 15) is pictured sitting in the launch cradle next to the Menominee River on the morning of her launching. 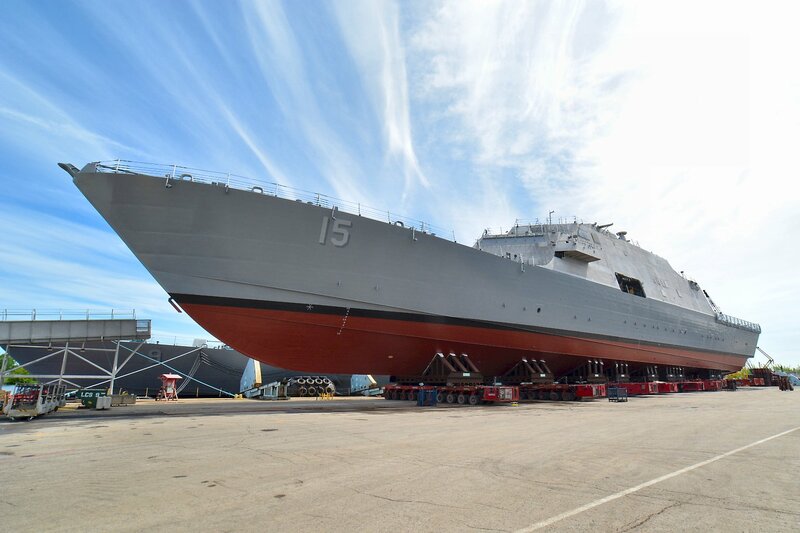 Already in the river, just ahead of the launch area is the future USS Little Rock (LCS 9). 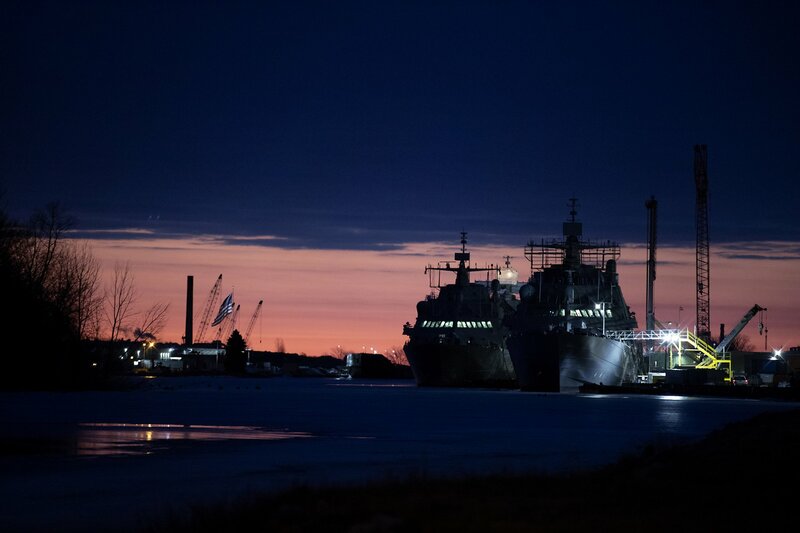 487k 01 July 2017: Marinette, Wis. - The future USS Billings (LCS 15) is pictured sitting in the launch cradle next to the Menominee River on the morning of her launching. 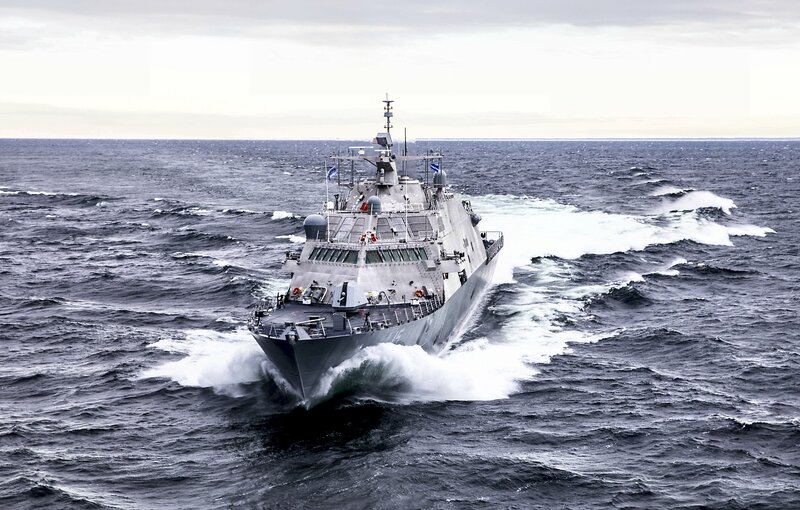 Already in the river, just ahead of the launch area is the future USS Little Rock (LCS 9). 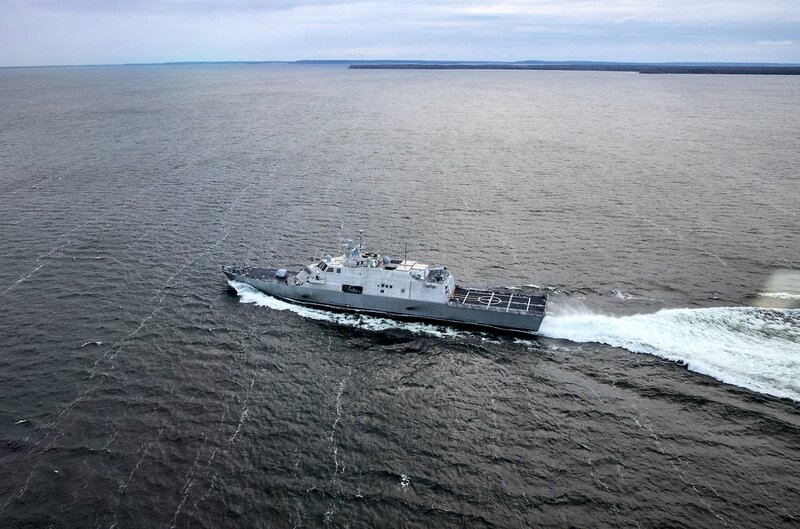 297k 01 July 2017: Marinette, Wis. - LCS-15's sponsor Sharla Tester, the wife of Montana Sen. Jon Tester, the ranking member of the Senate Veteran's Affairs Committee, christens the future USS Billings. 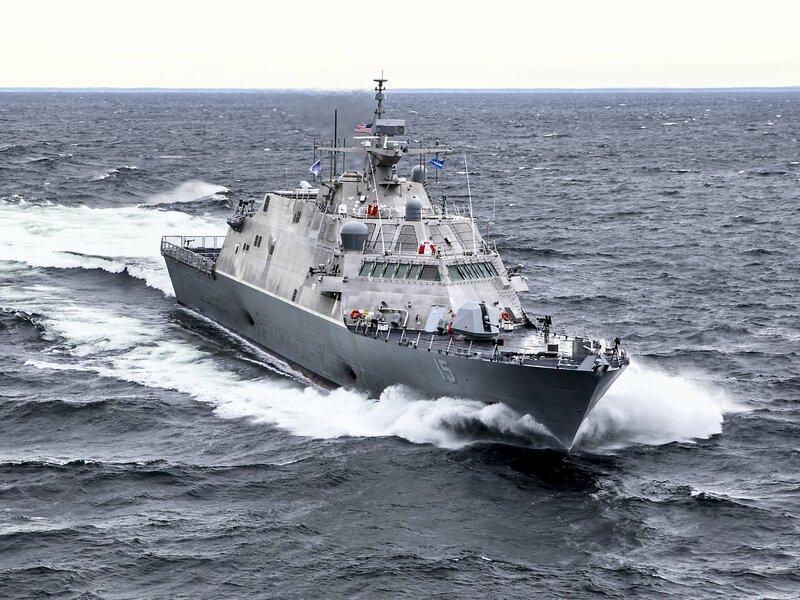 Once commissioned, LCS-15 will be the first ship of its name in naval service. 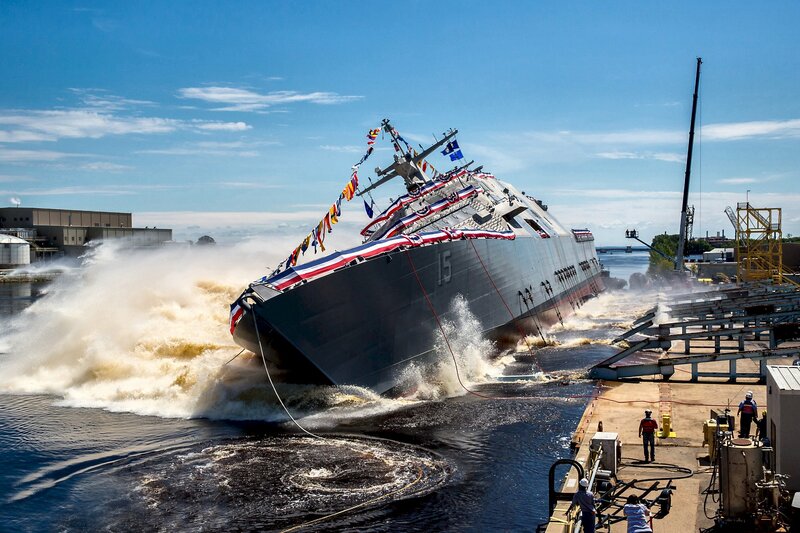 631k 01 July 2017: Marinette, Wis. - The U.S. Navy's future USS Billings (LCS 15) launches sideways into the Menominee River in Marinette, Wisconsin, following its christening by ship sponsor Sharla Tester. 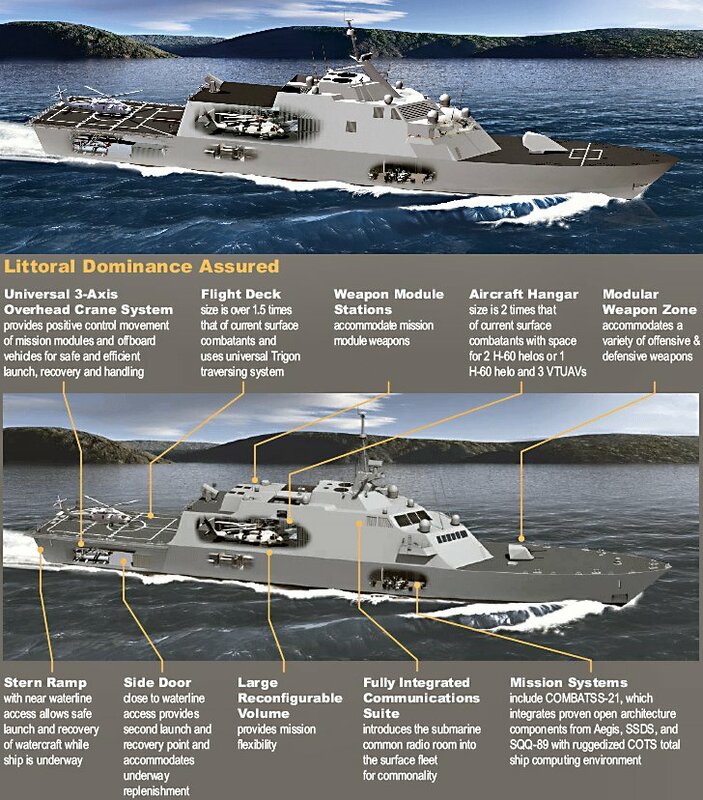 17th littoral combat ship, an adaptable platform designed to support focused mine countermeasures, anti-submarine warfare and surface warfare missions. 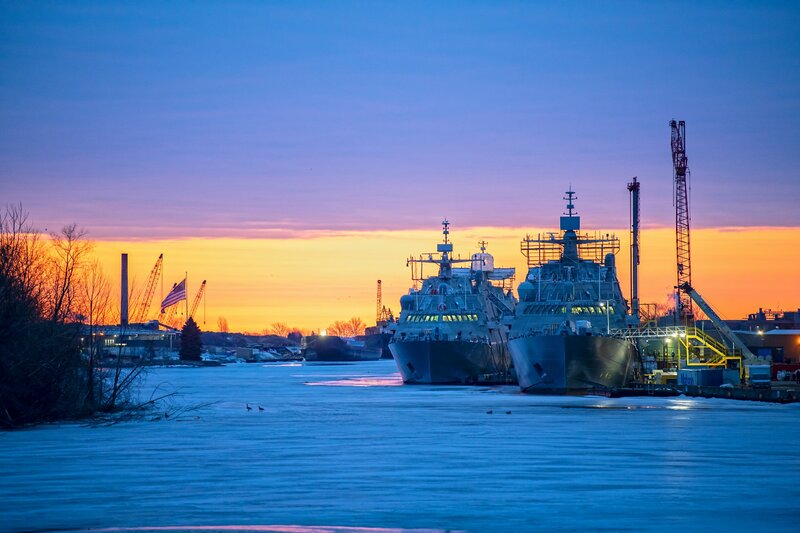 460k 15 December 2018: Marinette, Wis. - An early morning view of the Marinette Marine shipyard from the Menominee River as the future littoral combat ships USS Billings (LCS 15), left, and USS Indianapolis (LCS 17) are moored in front of USS St. Louis (LCS 19), before St. Louis' christening, 15 Dec. 2018. 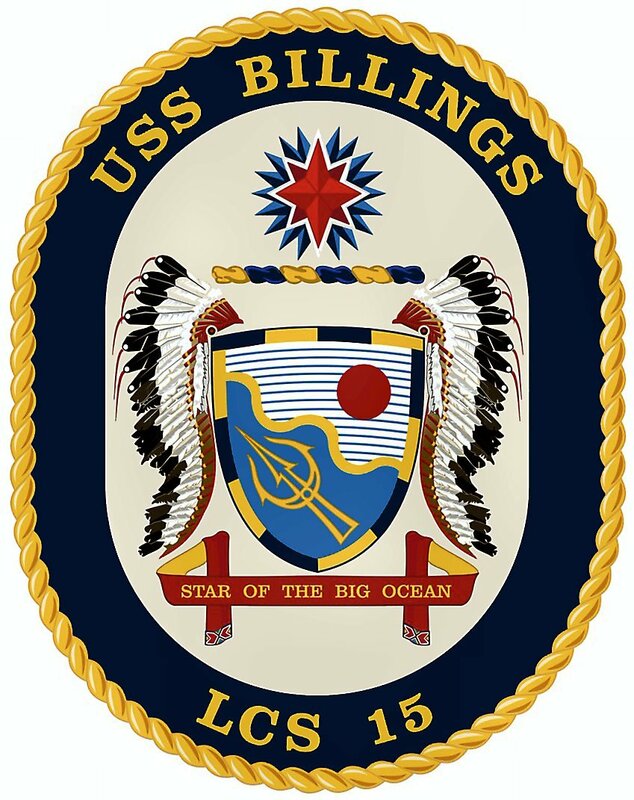 View the USS Billings (LCS 15) DANFS history entry located on the Naval History and Heritage Command web site.